You know you have a very bad boiler when . . . This sounds like a set-up line for a comedian. But in this case it’s an actual boiler that had been in someone’s home and was even used to provide heat as late as last year. And then it literally fell apart. In this situation, the customer was out of options. 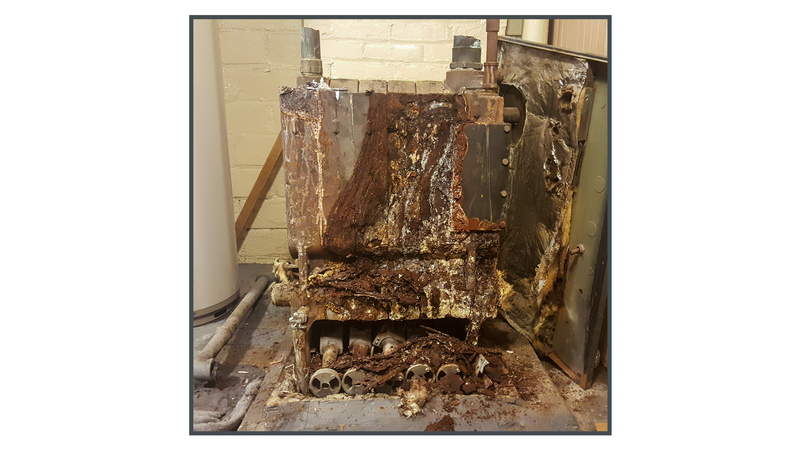 It was either new boiler time or bundle-up for the winter – and hope it’s a mild winter. If you live in Cleveland Heights or Shaker Heights you may even have one of these hidden disasters lurking in your basement. Don’t always judge a book by its cover. Or maybe you should. Particularly if it’s something you’re going to depend on 24 hours a day, seven days a week during the heating season. And if the temperatures dip into the single digits you had better be living a charmed life or get ready to film your own version of “Life Below Zero” for TV. This all leads to the greater question: how do I know when it’s time to replace my boiler? For the customer in Cleveland Heights or Shaker Heights (or even Lakewood) who have relied on a boiler pictured above, the answer is obvious. But not all boiler replacement candidates are as obvious. Which is why you should have your boiler or furnace undergo a yearly clean and check for proper safety and maintenance. The technician will be able to inform you if something is in a state of failure or has failed. Recommendations for repairs are offered. But making an extensive repair on old heating equipment needs to be carefully considered. The same consideration you would give putting a new car engine or transmission into a very old car. Some days you can trust your own eyes. On other days you need to trust the eyes of Verne & Ellsworth Hann. If you live in Cleveland Heights or Shaker Heights there is only one phone number you should call: 216-932-9755. Life is full of surprises. Don’t overlook the one hiding in your basement.